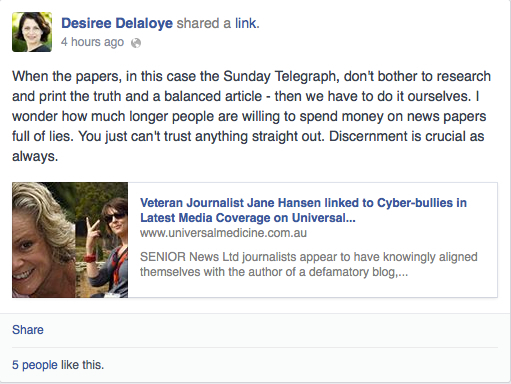 The email exchange between Universal Medicine cult leader, Serge Benhayon and News Ltd journalist, Jane Hansen around her Sunday Telegraph Report. Spoiler alert: He doesn’t answer the questions. In October 2013, Universal Medicine’s UK charity, the Sound Foundation, in Frome, Somerset was issued an action plan by the UK Charity Commission over issues of public benefit and trustee conflicts of interest. In other words, the cult was busted running a tax exempt sham and given a deadline to start acting like a legitimate charity – by spending money in ways that benefit the public rather than the Benhayon family of bullshitters and an assortment of hangers on. Given that the charity’s income in the year ending September 2012 was £1.2M and the charitable spending that year amounted to a piddling £74K, we were hoping for big things before the deadline of May 1. But nuh. The maternity unit at Frome Community Hospital were given a few chairs…For the staff. And we know why the cult likes to butter up medical staff.